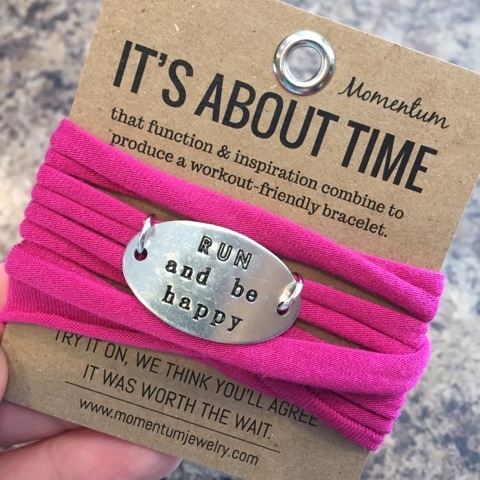 My last minute Runner Gift Guide....Some of these may surprise you! Are you looking for last minute Christmas gifts for the runner in your life?! Or maybe looking to pick up something new for yourself that you haven't thought of before? 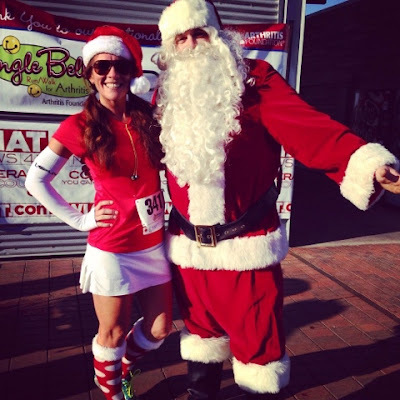 I'd like to share with you my top 15 gifts for runners that I think are just great! This list is arranged in no particular order and fall within all ranges of budgets. Some of these items, I own and some of these items I have on my own wishlist! 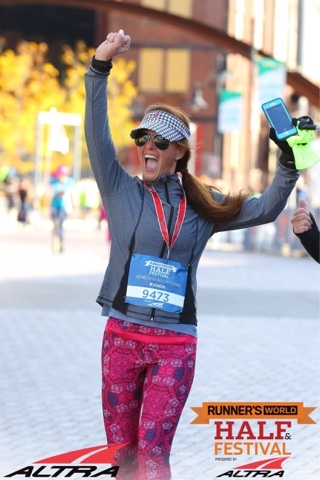 I'm a shutterbug and take one million pictures of all my races! I cannot afford to buy all of those race photos but I can afford a great printer and ink subscription! 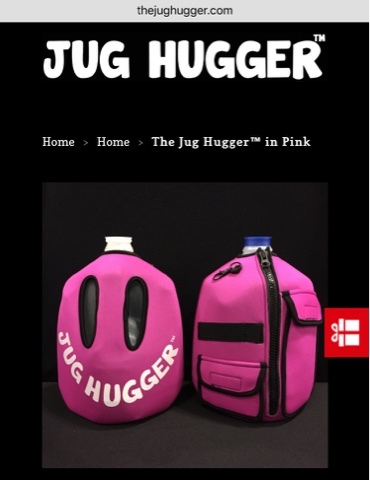 This is one of my top gift ideas for runners that maybe most would not think of. 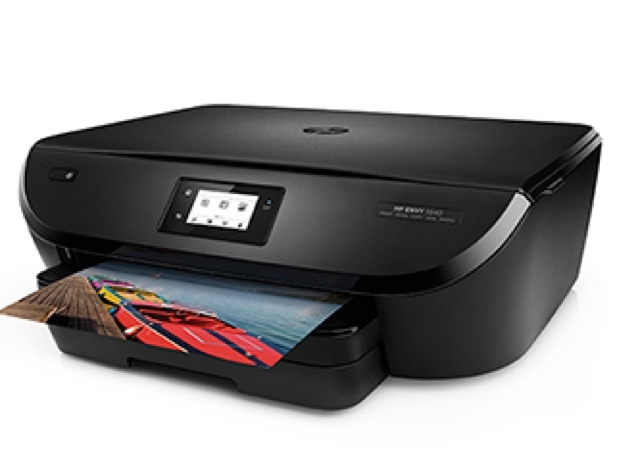 "The HP Envy All-in-One printer is a great compact solution for your home and office printing, scanning and copying needs. Now, when you buy the HP Envy 5540 e-All-in-One printer, it comes with 3 months free of HP Instant Ink! One of the things that I did in the year 2015, was to exchange my regular pancake mix for Protein Pancake Mix. After trying a few different brands, AboutTime is one of my faves. There are three different flavors to choose from...Maple Syrup, Cinnamon Spice and Chocolate Chip. Retail price is $39.99 on www.TryAboutTime.com. 3. 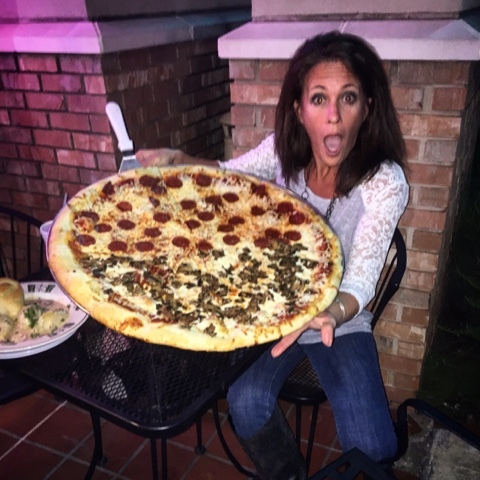 Give the Gift of PIZZA! Check around for your local pizza parlors and grab that gift card! Okay. This is a NO BRAINER. Runners love shoes. Runners need shoes. I have friends that are very loyal to "their" brand. I'm that way to a certain degree. I have certain shoes that I like to run my long runs in. I have certain brands that I like to wear with cute outfits. (Yes, I just admitted that.) 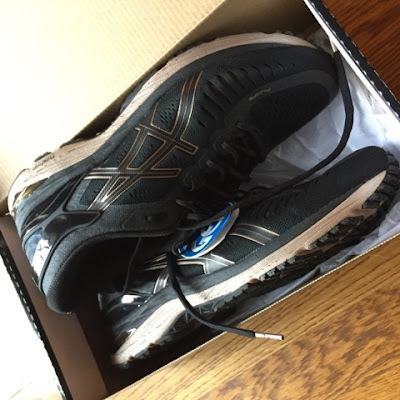 I have certain running shoes that I wear on my shorter runs. Below are the new Asics Meta Run Shoes...These babies are packed full of brand new technology that will have the runner in your life running on cloud nine for sure! Retails for $250 on Asics.com. Sewing Machine?? Yes. That's right. I included these machines on my gift guide list. 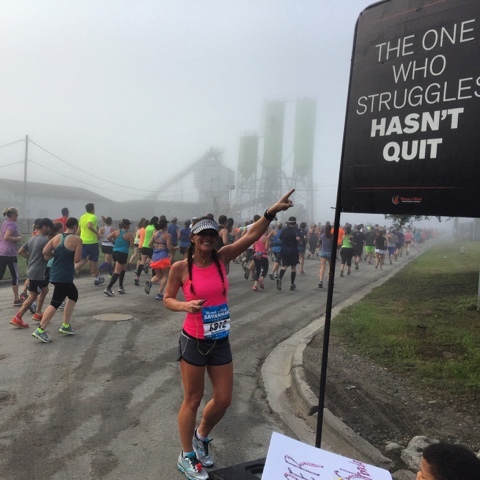 I run lots of races that I think sometimes..."I wish I had a tank top with this written on it." With these machines, I could do that. 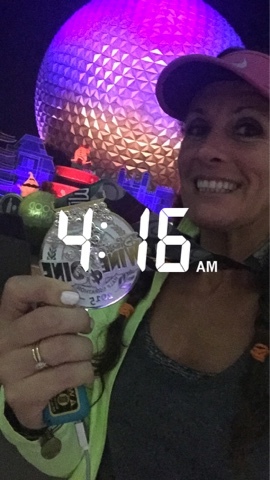 I also run a lot of runDisney races and could use the Disney templates with lots of things. The Brother PE 540D, is the Disney embroidery machine. 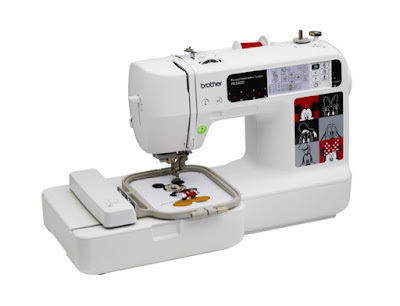 It has 105 built-in embroidery designs, including 35 designs featuring Disney characters plus 5 embroidery letter fonts. It can be purchased on Amazon and retails for $399. 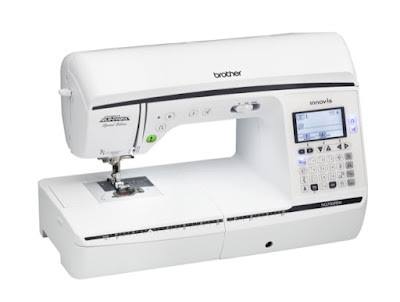 Brother is also the exclusive sewing and embroidery machine company of Project Runway. Its a machine made for the designer in you! 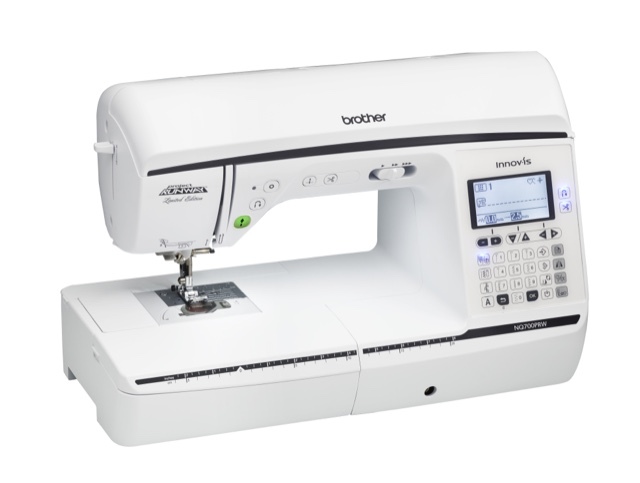 The Innov-is NX700PRW is a sewing and quilting machine with 180 built-in stitches. I am super particular about what I eat and am always looking for new recipes. 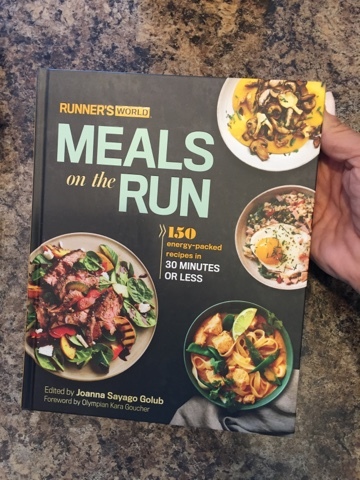 Runner's World Meals on the Run was created specifically for runners. There are over 130 healthy recipes included that can be prepared in 30 minutes or less. My kind of cooking! Saving time in the kitchen and more time pounding the pavement! Retails for $26.99 on www.RodaleBooks.com. This one is HUGE!! 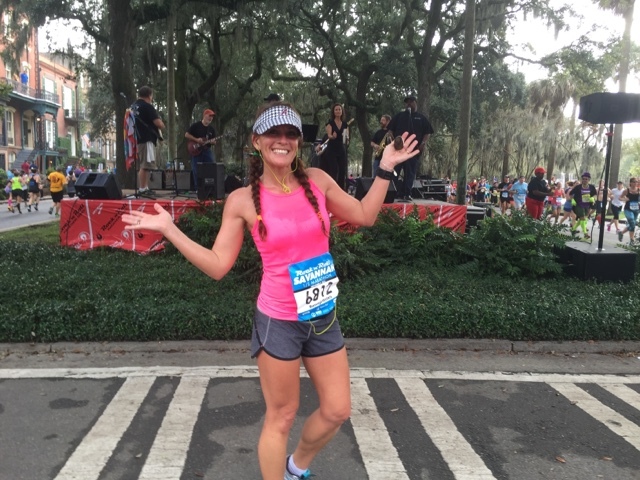 Runners will often pass on races or put them on their bucket lists just because of location! I do this so often. 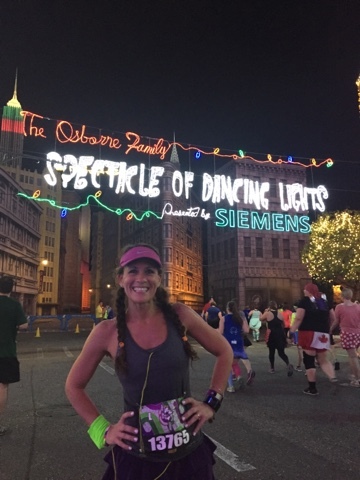 One of my favorite places to run is through the theme parks of Walt Disney World and Disneyland. However, I can't afford every race at these locations. Gift cards pertaining to travel would help out so much! Consider airline, gas, hotel and restaurant giftcards. 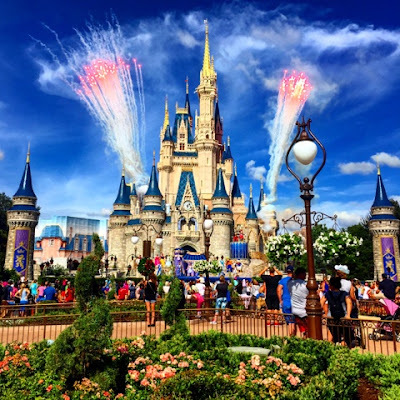 I use the girls over at Mainstreet Memories for all of my runDisney travel needs and they can help out with all of those Disney vacations, even family vacations and cruises! Make sure to tell them I sent ya for extra love! ;) Prices Vary. 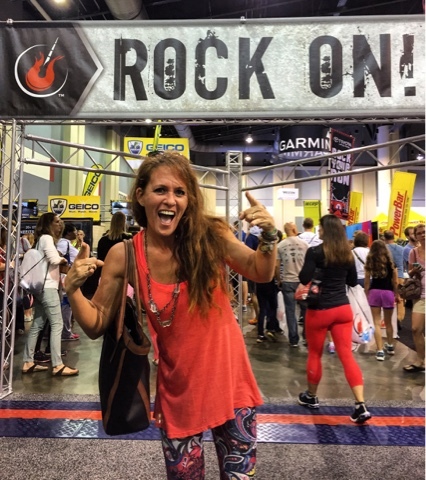 Find out what your runner loves to indulge in! Is it a massage? Is it a cup of coffee? For me, I absolutely love to drink coffee after I run. 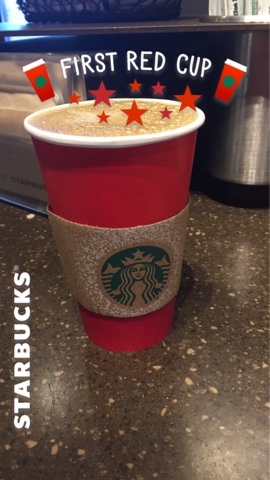 I freeze after I cool down and a hot cup of joe hits the spot. Treat your runner to their favorite indulgence...they worked hard to get to the finish line, make that finish that much sweeter! Prices Vary. 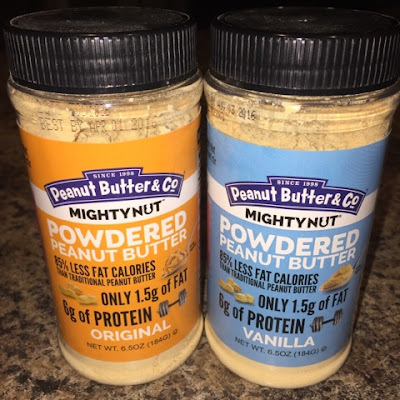 Earlier this year, I tried out Peanut Butter & Co. Powdered peanut butter through a campaign with Sweatpink. I really liked it and now keep a jar in my gym bag! 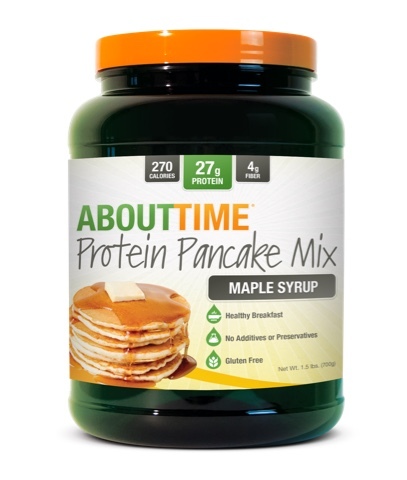 Super easy to add to my shakes and mix with water for old fashioned peanut butter. This particular powdered peanut butter comes in four flavors (Original, Chocolate, Flax & Chia and Vanilla) and can be found in most local grocery stores or online for $6.50 on MightyNut.com. And all of the runners said....AMEN!!! One of the best races that I ran one year was a race that my husband and kiddos gave to me for Mother's Day. That trip was a total guilt-free trip and was because I felt like I had been given total permission to go! Especially being a Mom Runner, this has been an ongoing inner battle since the day that I've started running. 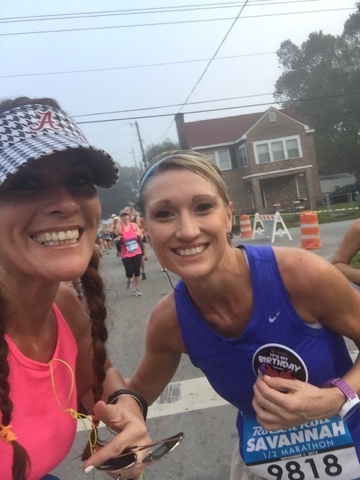 Race registrations don't have to be destination races...check around in your local city for races. Prices Vary. Another cool thing to consider is that if your runner is running a race for charity, donate to their charity!! 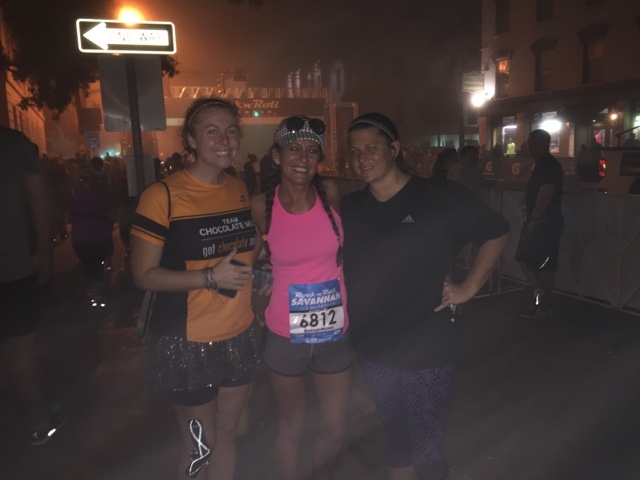 Helping them meet their goals not only helps out the runner but helps out those in need. 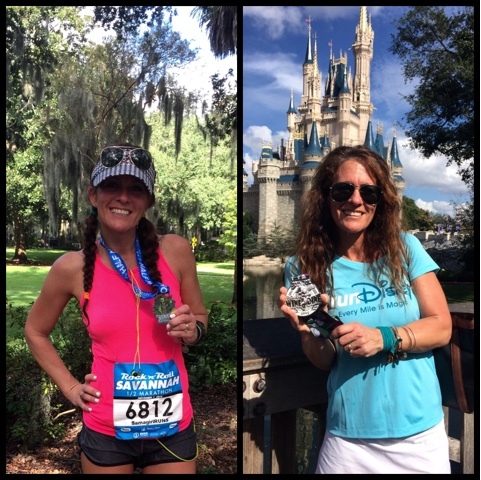 I'm raising funds for Disney's Princess Half Marathon Weekend in February on behalf of OHOH.org and would absolutely love for my friends and family to donate to my charity rather than buy me a gift! Please visit my fundraising page HERE!! 11. New Dri-Fit Running Socks! 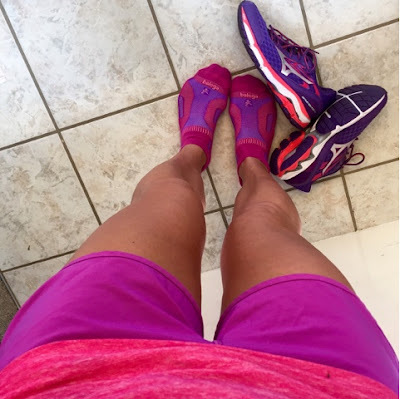 I will try out most brands on any running gear but I do have a favorite running sock. Hands down, I love my Balegas. I have a zillion pairs of whites and lately have bought a few new pairs of colored ones. These socks can be found at most local running stores for approximately $12. This product is one of those things that every runner should own. You never know when it will come in handy! It can also be worn un-frozen as a stability wrap. So many uses! Prices range from $17.99-$27.99 and can be purchased at many Race expos or online at www.DrCoolRecovery.com. It's no secret that I'm a major fan of jewelry and accessories. I love running with bracelets that have charms with meanings and inspiration. Such a cute way to show off the things that I love! 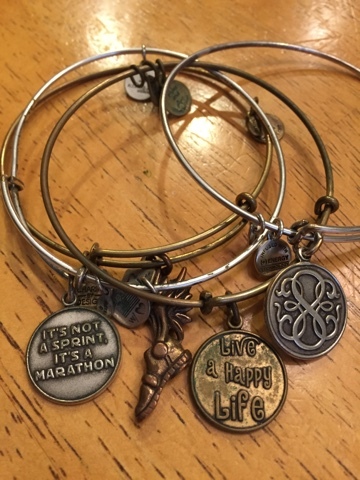 The Alex & Ani bracelets below are the bracelets that I wear everyday. I run in them. I sweat in them. I wear them when I'm not running! Yes, I know, I'm allowing them to tarnish. That's also one of the reasons why I love them....I love the reminder of all of the sweat that I put in. 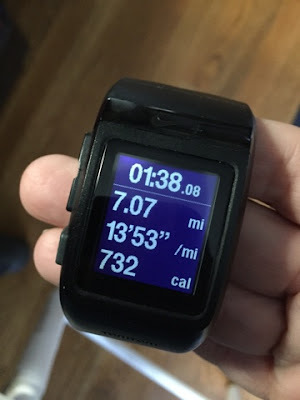 I glance down at my watch during a run and see the quote "it's not a sprint, it's a marathon" and I take it to heart. That particular quote was given to me earlier this year and I absolutely love it. Seriously, it is my fave. #AllTheLove. In today's world full of technology, I know that it's pretty common to download magazines onto your ipad, phones, kindles etc. 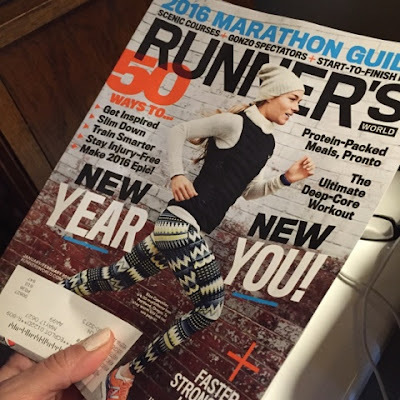 However, I'm old school and still absolutely LOVE going to my mailbox and receiving my Runner's World Magazine every month! I throw it in my purse or gym bag and read it when i'm in carpool or have a little bit of down time. 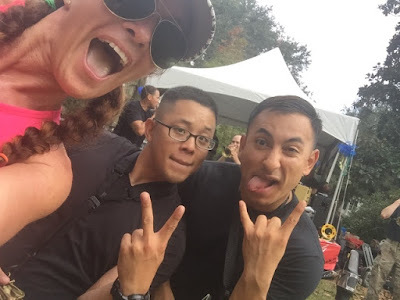 I find all kinds of information on races, gear, nutrition, etc. in this magazine! I like to read a little bit at a time...it's like a little bit of Christmas for the running nerd in me each month! The last gift on my list (and these gifts were in no particular order by the way...) is something that I recently have become obsessed with! The Jug Hugger!! Retails for $29.99 on TheJugHugger.com. 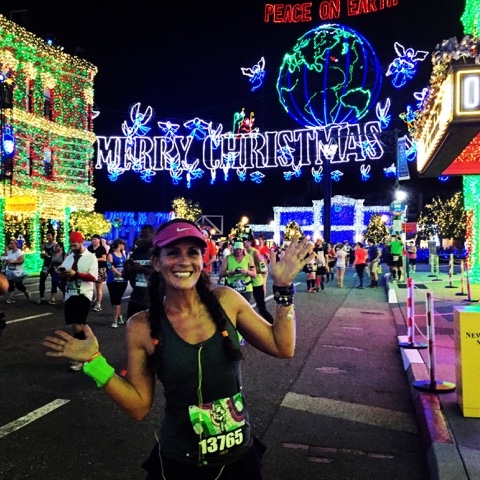 Happy Running, Happy Shopping and Merry Christmas Y'all!! 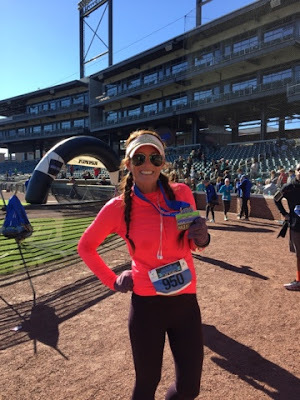 My 35th Half Marathon, Finished! It's hard to believe that TOMMOROW, MONDAY NOVEMBER 30TH marks the 12th week post breaking my ankle. This has been the LONNNNNNNNGEST 12 weeks of my life. I'm still taking it easy some days. And then some days, I just wanna run until I can't run anymore. I'm thankful to be running so I don't care if it's with my running group, by myself or on my treadmill. This morning I woke up to a group text from my Bootcampers heading out for an early morning run. I was exhausted from the long Thanksgiving weekend so I slept in. I needed some extra zzzzzz's and I'll thank myself later for it. One thing that I'm really going to do in the year 2016 (and I'm starting a little before 2016) is to really try to focus on what's good for me. Maybe that sounds a little selfish but I'm okay with it. I find myself always dropping everything to work around everyone else's schedule. Compromise is a beautiful thing. 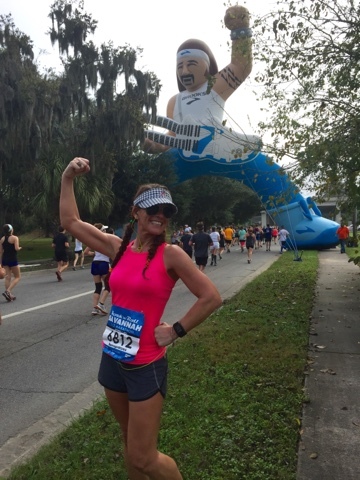 Since my break, I have ran my most favorite race EVER (Runner's World Half Marathon), Rock n' Roll Savannah Half Marathon, over half of runDisney Wine and Dine Half Marathon and now Magic City Half Marathon. I couldn't be happier or prouder of myself and I did all of those races by MYSELF. 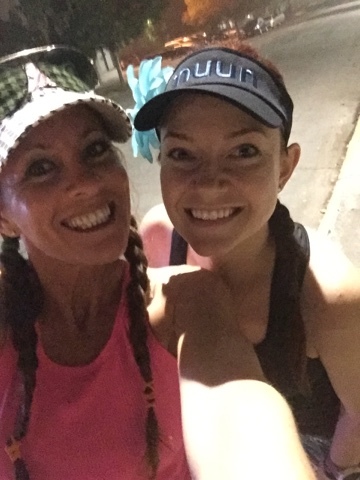 46.4 miles with Kristin. No running friends crossing the finish line with me on those races listed above. It's been hard and disappointing to say the least but it's been a great lesson. I had different expectations going into some of those races but the outcomes were PERFECT for me. These are the moments when I learned that no one else will make you a priority. You HAVE to make your own self priority #1. And there is nothing wrong with that. 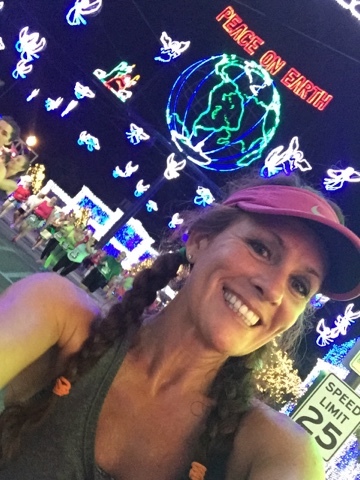 On Tuesday, I will quietly celebrate another year on this fabulous earth so I decided to treat myself to Rocket City Marathon in two weeks. Yikes. Just like that, I've added a full marathon to my schedule. I'm not completely trained for a marathon but I need to log the miles. I'm still running Dopey Challenge in January (48.6 miles over the course of 4 races) and I gotta get the miles in. I will be smart on the course. No chasing a PR. No keeping up with my running group. No shame in doing my own thing. I like digging deep and pushing through when the mental game kicks in. My mental game is STRONG, much stronger than my legs will ever be. 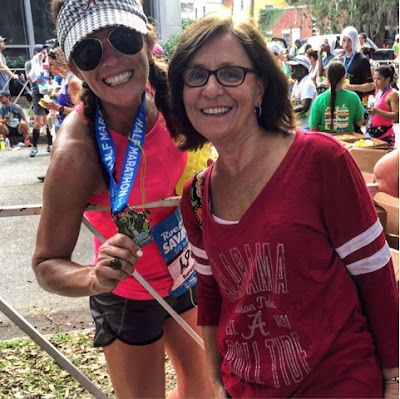 I'm excited to run another Full Marathon in Huntsville, Alabama in two weeks. Eventually, I hope to cross off all of the races in Alabama. The medal looks cool and it's a Boston Qualifier. 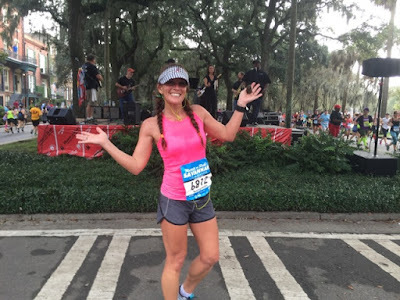 I'm going to spend the next two weeks prepping my brain to run 26.2! 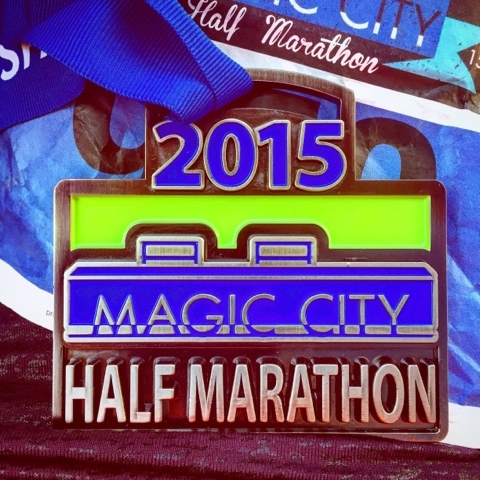 2015 Magic City Half Marathon Bling! 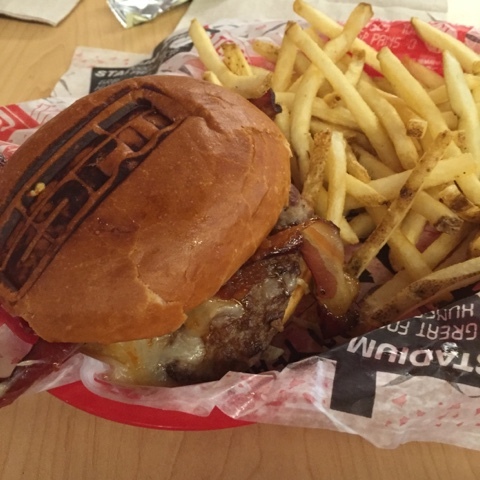 are donated to the Ruben Studdard Foundation. 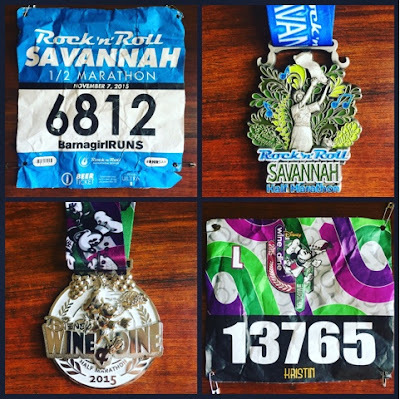 My Rock n' Roll Savannah & runDisney Wine and Dine Half Marathon Challenge....Who Wore it Best?!? 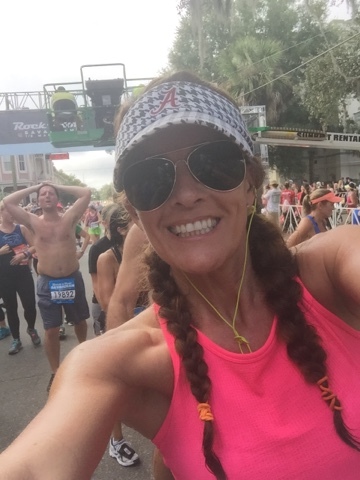 two races that were supposed to be Half Marathons on the same day! Disclaimer: I attempted and created the challenge in this blog post on my own. I did not receive any special favors from runDisney or anyone else to logistically pick up my race packet within the time that the expos were opened and/or closed. I started each race in the corral that I was placed by the race officials so I completed these races exactly where I should have based on those placements. I did receive a complimentary entry to the Rock n' Roll Savannah Half Marathon because I am a Rock n' Blogger. All opinions of these races are my own. I am a HUGE fan of both of these race organizations and I do not want this blog post to be a negative portrayal of either race. Honesty does not equal negativity. These were my race experiences and I can only speak for myself. 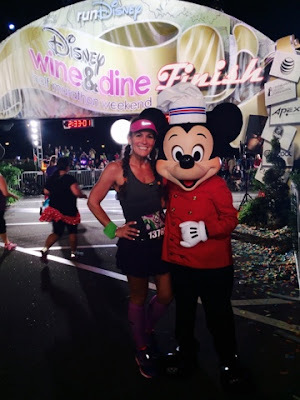 I do plan to run future Rock n' Roll and runDisney events in the very near future. Most people that know me in real life, know that I have no hesitations when it comes to running multiple races on the same day. I get asked questions like..."How do you do it? Why do you do it? What are you thinking? Are you crazy?" I really don't have answers to those questions other than......I suppose I really just like to run. Or I really am crazy. Or my Dr. told me that I couldn't run challenges for a while. Or someone once told me that I could do it but I never would. Or there are two races in one day and it's just convenient. Or I want lots of medals. Or I'm bored and like something new. Or I got a comp entry. Or I'm tired of the same 'ole course. I would say that it's a good combination of all of the above. This year, I was over the moon excited to be accepted as a Rock N' Blogger for the Rock n' Roll Marathon Series. I knew I wanted to run a race with them that I had not run before. I also wanted to run the strip in Las Vegas too. 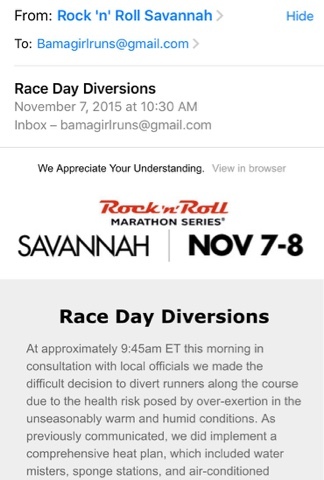 Vegas didn't happen due to personal reasons so I settled on Savannah. Savannah was close enough that I could drive and not have to turn it into a week long ordeal. When I was deciding on that race, I also knew that runDisney Wine and Dine Half Marathon was the same day. Hmmmm. This could be an okay idea. I had ran the Inaugural Wine and Dine Half Marathon over five years ago. However, I did not particularly care for this race so I had not been back. I do like a fall runDisney race so I started running the Twilight Tower of Terror 10-Miler and Happy Haunted 5K instead. Those were two races on the same day. 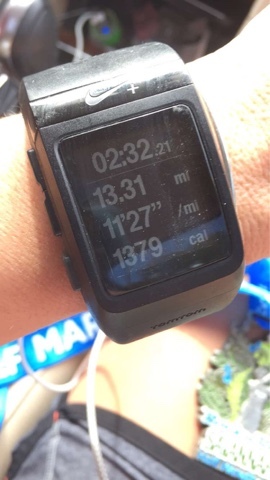 A total of 13.1 miles. I had done this for the past three years. 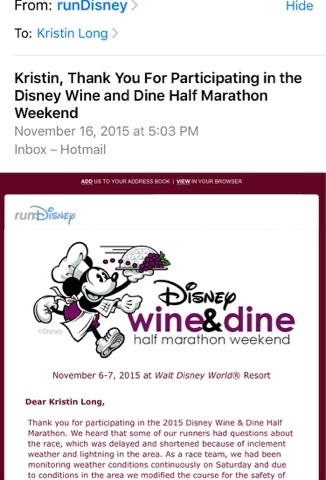 I'll give the Wine and Dine Half Marathon another shot. I have heard good things over the years. 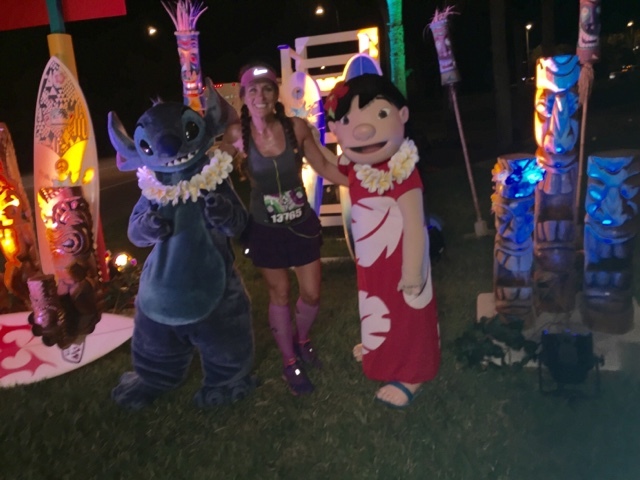 I have heard others say how this was their absolute favorite runDisney race. Great! I'm in. So my challenge was born. I would set out to run Rock n' Roll Savannah Half Marathon on Saturday morning and then go immediately to Orlando and run the runDisney Wine and Dine Half Marathon on Saturday night. I checked all of the times for the expos, the start times etc....I could totally pull this off. 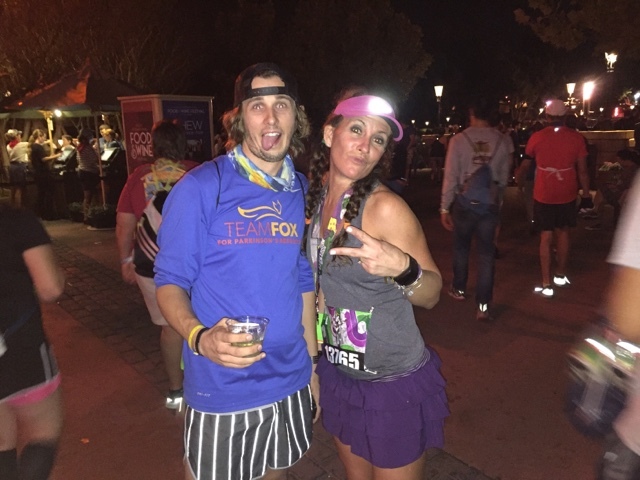 I have heard of other runners taking on this challenge and they were able to pull it off no problem. 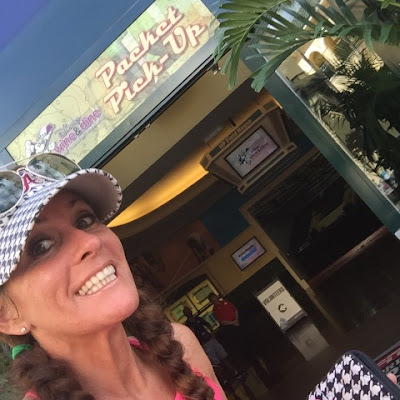 Someone would pick up their race packets for them in Orlando and have them waiting for them so that when they got there, it would be an easy trek to the Start Line. First Snag in my plan. runDisney has changed their packet pickup policies...no one else can pick up your race packet for you. Lovely. Now I knew that I needed to run an approximately 2:30 Half in Savannah in order to make it to the expo in time to pick up my packet. Oh Lord help my soul. Please please please let my ankle hold up so I can do this. So far, I've only ran 1.5 miles straight through and here I go about to attempt a Half Marathon under a time crunch. EEK. I probably could have picked up my bib for Wine and Dine late that night just before the race but that's not how I wanted to do it. I wanted to be legit. I didn't want to bend any rules and I didn't want any favors. 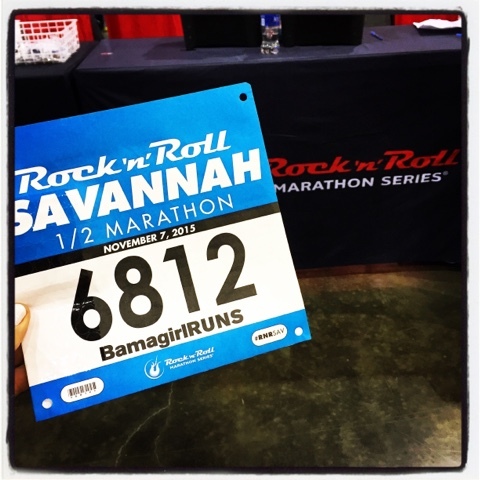 ---You must be present to pickup your own packet for Rock n' Roll races series....This means I had to arrive in Savannah on Friday night. 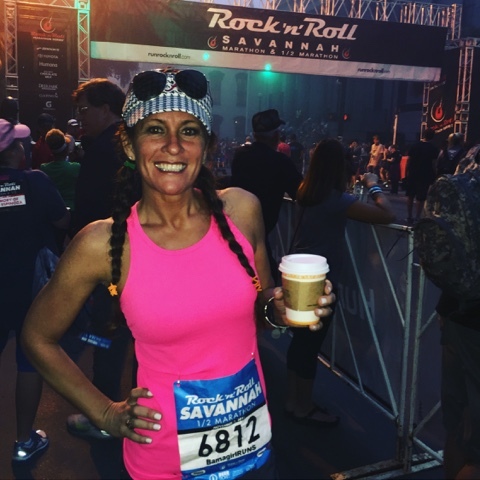 ---The race in Savannah starts at 7:00am. Two and a half hours later would be 9:30am. 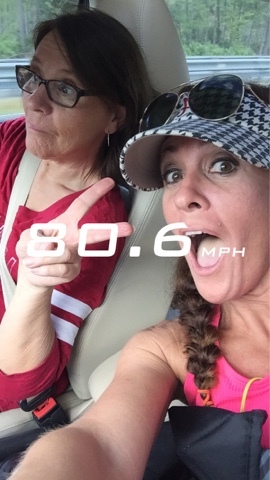 ---It is an approximate 4:15 hour drive from Savannah to Orlando. ---The Wine and Dine Half Marathon Expo closes at 3:00pm on Saturday and you must be present to pick up your own race packet....I guess everyone wanted out of there to go watch the 3 O'clock parade. LOL. I arrived in Savannah Georgia late in the afternoon on Friday evening...somewhere around 4Pm. I waited on the bridge and dealt with horrible traffic getting into the convention center to pick up my packet. Rock n' Roll warned us not to do that but I've never been to this expo and was in my car so I didn't even know how to get to the ferry and all that jazz. Regardless, I finally made it into the expo around 5:00 (The expo closed at 6:00). I had an hour to spare. 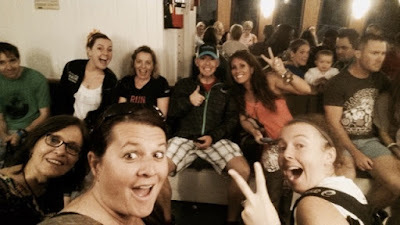 I met up with some friends, we walked around, grabbed our packets and then went out for dinner. Beautiful foggy night in Savannah Georgia. Rock n' Blogger in the house! Fun night out in Savannah with this crew! The next morning, I woke up and rode over to the Start Line area with some friends and my Mom. One of my friends is on Team Chocolate Milk so we did have a VIP Parking Pass that was a few blocks away from the Start Line. That was great! I like not having to figure out where to park. Just let me plug it into the GPS and let's go! Start Line and Hot Coffee! we are the best of buds and wish I could run with them every weekend! Here was the next snag in my plan. THE WEATHER. 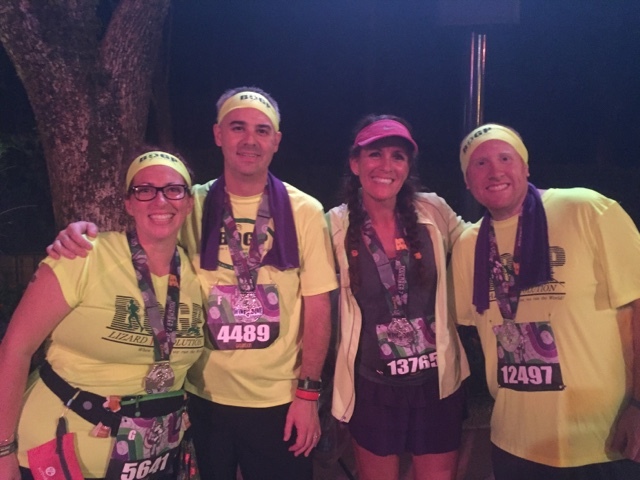 Both Rock n' Roll and runDisney had sent out severe heat warnings for both races. That didn't really bother me too much either. I live in Alabama. Most days it feels like I'm running in an oven so I knew that I would be okay. 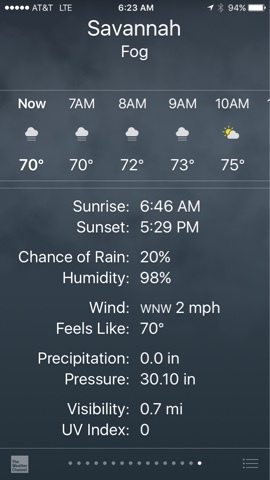 I deal with humidity everyday....Now you know why I have BIG HAIR. Back to the race, I stopped for a quick pic at the 5k mark. I saw a cool sign. 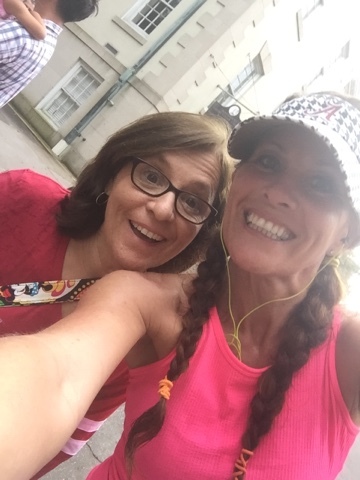 I was in the middle of tweeting that out and I ran into an Instagram friend who was trying to break the 2 hour mark so I chatted with her for a few. After that, I was back to running. I stopped at every water stop. 98% humidity and running two races, I knew that I needed to be hydrated. By this time, there was not a dry spot on my clothes. Sweat was just running down my legs. Gross. My sunglasses were so fogged up that I would have to keep taking them off to wipe them with my nasty soaking wet shirt. 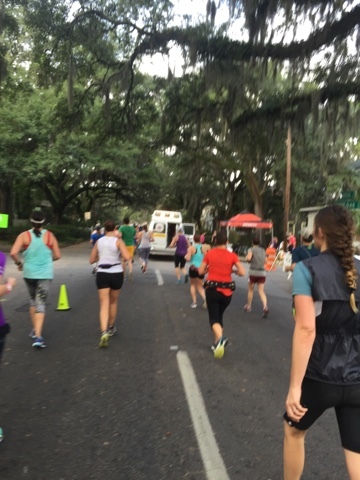 By mile 6 or 7, the spectators were lining the mossy covered streets Savannah and this was a super fun race! I saw my Mom around that time too. She's my biggest chEARleader! I was ready to finish this up already. I kept my eye on my watch. I was on pace to finish at my goal. By mile 9, My left foot (not my foot that I broke) was KILLING me. I think I had tied my shoelaces too tight. Ugh. I hate this feeling. My foot felt sooooooo bruised. I must have stopped 10 times throughout the race to loosen up my laces. My right foot with bad ankle was great. Stupid left foot. Fabulous right foot. Both of my pinky toes were also blistered. I could feel it. I couldn't help the sweat at this point. It was just pouring off me by the bucketfuls. I think I was the nastiest person in Savannah at that moment. I dreaded crossing that finish line and having to see what my pinky toes looked like. Maybe I just won't look. Double Gross. I had my music in my ears and I was scooting along pretty good. There were a couple of times that I felt nauseous...I'm guessing because of the heat. 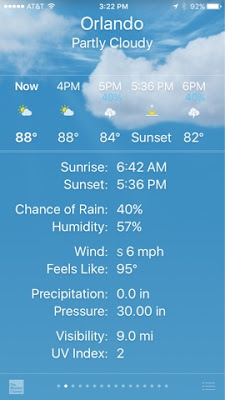 At this point, it's feeling like 90 degrees or so. One thing that I noticed was I was seeing A LOT of runners down. By mile 10, I had passed at least 10 runners laid out. Medics were on sight for the runners that I saw down other wise, I would have stopped. This part of the race was a MESS. 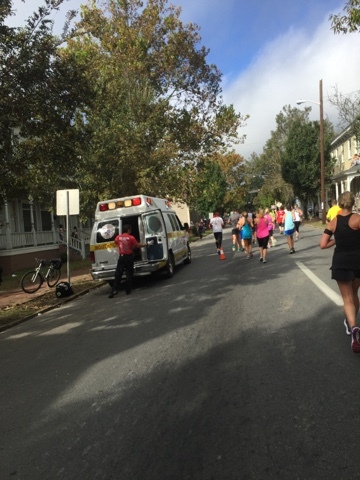 I had an ambulance drive up next to me around mile 11 and that's when I took the music out of my ears. I could hear sirens coming from all over. I knew the end result would not be good for some. I prayed right then for those runners and their families. 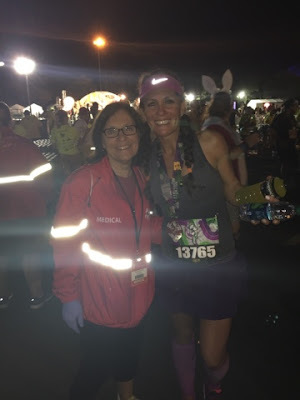 I know that one runner in particular that I passsed was completely purple and I knew that this was not normal for a runner that had passed out or was unconcious due to dehydration. I've been that person who has sat with runners when this happens or have helped someone after they've passed out. Sadly, I know what this looks like. I quit counting the runners that were down. I didn't want to see anymore. I ran around a few ambulances that were parked on the streets. This was awful. 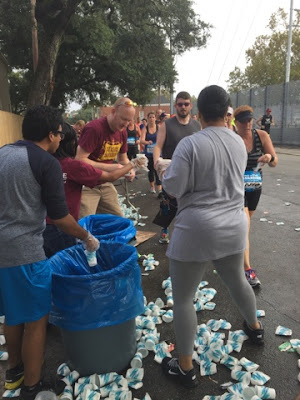 The cups at the water stops were filled with ice now instead of water and the volunteers were dipping the water out of trash cans. 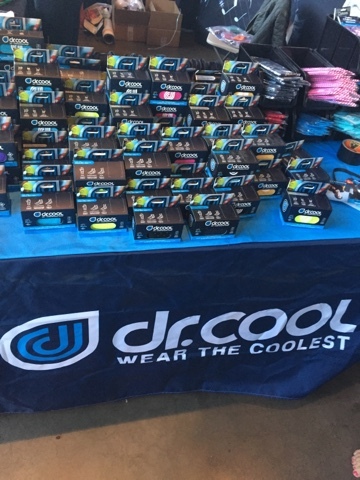 Anything to keep these runners cool and hydrated. On to the finish line. 2:32 Finish time. I was excited. I was relieved. I was THANKFUL. My mom was waiting at the finish. Rock n' Roll provides great snacks, drinks, protein bars at the chute. I grabbled an armful and headed out! 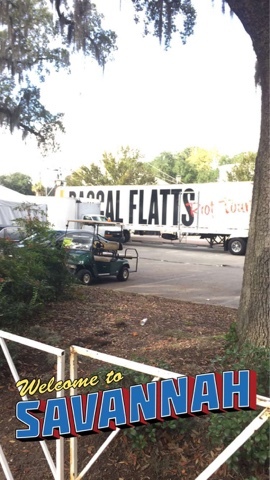 The headliner concert was Rascal Flatts...sorry Flatts, I'll have to catch you in Nashville. I gotta hit the road! We headed back to the car. Small problem. That parking pass that we had?? Yeah we couldn't remember how to get back to the lot. We walked around looking for the car for wayyyyyyyy too long. I'm starting to stress. We finally found the car, pulled over at the first gas station, fueled up, used the restroom, grabbed a cup of coffee and we were ORLANDO BOUND! That was the story of Rock n' Roll Savannah....Here's the story of runDisney Wine and Dine Half Marathon. No traffic problems from Savannah to Orlando. Holla! I pulled into ESPN Wide World of Sports Complex at 2:30pm. By the time we parked and walked in to the Josten Center, I got my bib and had exactly 12 minutes to spare before this expo closed! YES!! I did it!! I was still wearing my soaking wet race clothes from Savannah and my Mom was telling me that I smelled really bad. She didn't have to do that. I already knew it. YUCK. 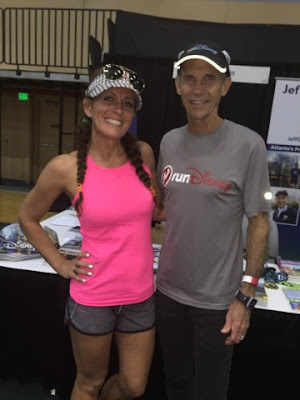 I grabbed my shirt, stopped for a quick pic with Jeff Galloway and bought a runDisney shirt from the official merchandise booth. I went over to the KT Tape booth and wanted to get my ankle taped but they turned me away. BOOOOOO. They said that it was 2:55 and the expo closed at 3:00. Oh well, I'm running tonight with no tape. It wasn't the end of the world but I would have liked to have the stability. On my way out, I stopped by The Stick Booth. I got a two minute massage on my shins and and calves. I was so flippin' starving at this point. My mom made me order a big fat Bacon Cheeseburger from the Espn Grill. I don't even like bacon but I did what she said. On to the room. I need an hour nap and then I need to be up and at 'em again. My Mom was volunteering as a Nurse for the Wine and Dine Half so she is going to need to check in to her station by 8pm. Our plan was to be leaving the room by 7. Night night world. I woke up from my one hour nap, grabbed a protein bar, bandaged up my bloody and severely blistered pinky toes and drove my Mom over to where she needed to be. Bye Mom...see ya at Mile 4.9 (Animal Kingdom). After I dropped her off, I noticed some lightning in the distance. I had no idea it was even supposed to rain on this night. I drove over to Epcot to park the car and then shuttle over to Espn Wide World of Sports (Start Line location of the race). The traffic wasn't too bad but I did have to wait for 15-20 minutes for a bus. No big deal to me...I've got plenty of time. At this time, it was 8:45ish. 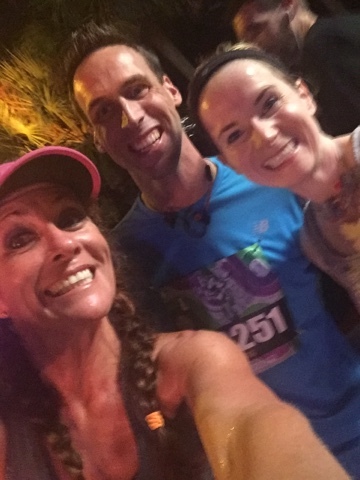 While I was watching the game, I got another text from my Mom saying that the course was indeed going to be cut short and the Animal Kingdom portion of the race was not going to happen. She and the rest of the medical voluntEARS were already being shuttled back to Epcot. Maybe 20 minutes later, we got the announcement that we could begin heading over to the corrals and the race would resume shortly. I was in the last corral of this race. I was one of the people who forgot to submit their proof of time. 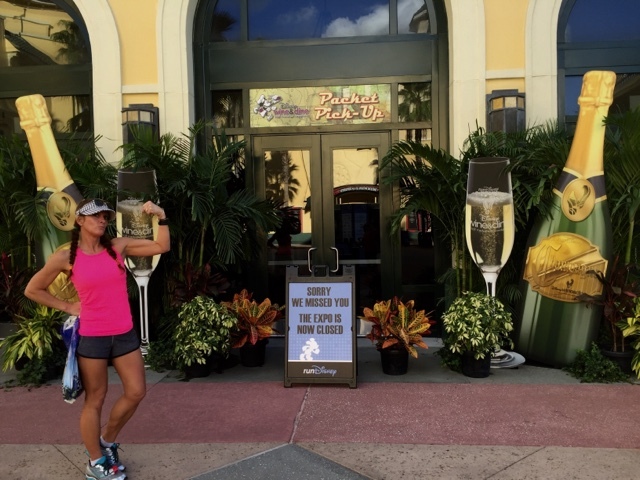 runDisney has changed their policies about this too and I totally forgot to do it. This would be a whole new experience for me. I've always been able to run kinda fast at home and submit a fast enough proof of time when I registered so that I would have plenty of time to goof off and really enjoy running through the parks. If I was going to start in the last corral, then I was going to start at the VERY BACK. 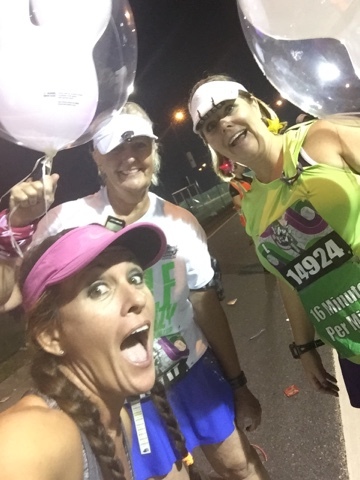 I've never seen the balloon ladies in a race and I was about to become their new BFF. I'm in no way trying to brag about this but I'm just able to run faster than a last corral placement. I was not mad or disappointed in starting in the last corral. 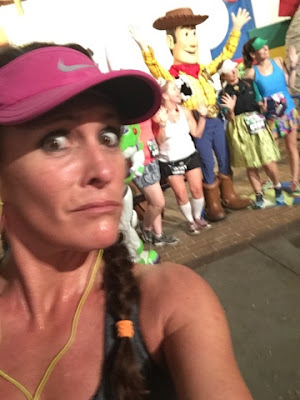 As I said before, I LOVE a good challenge and I've heard soooooo many people complain for YEARS about how awful starting in the back corral of a Disney race is and how the back of the pack runners can't run and how it's hard to not be swept. I really wanted to check out this scene. I waited for a while to assemble to my corral. I was the very last person to check my gear. I walked around and checked out the entire pre-race area. I finally found the balloon ladies and introduced myself to them. We had a photoshoot in front of the porta potties. The race had not started yet so I knew that we still had lots of time to kill. I sat on a sidewalk with the balloon ladies and we listened to the race announcers finally get the race underway. I'm not sure of the exact time but I do know that the last corral started at 11:51 pm. Almost two hours after the race was supposed to start. This is where I heard officially for first time that the race was going to be cut short. I knew that information but this was the first time that most runners had heard of this. The overall vibe from the runners was not good. runDisney had sent out a tweet to tell this to the runners but I never checked twitter (bad signal) until after the race started. Again, I'm not complaining. Just trying to relay the facts. I did meet a few folks in the last corral and I was really surprised to have met the "type" of runners that were back there. In my opinion, I would say that 75% of the last corral were faster runners who had forgotten to submit their Proofs of time. The four people that I was talking to in the back were those types. There were two people who had zero intention of finishing the race. One guy with a cane had just had double knee replacement and another girl was recovering from some other type of surgery. Both of those runners were wanting to start the race, get swept, receive the medal and then head over to the after party early. Again, these are people that I met. 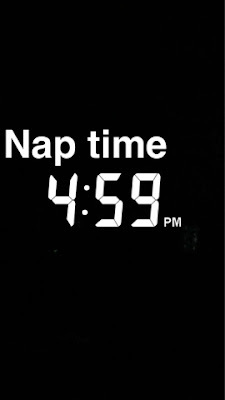 11:51pm. 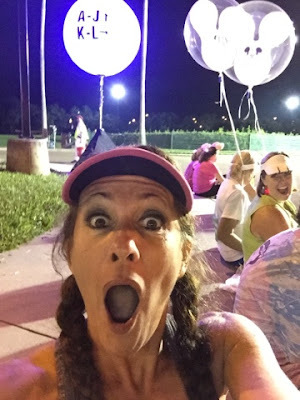 I took one last selfie with the balloon ladies, let the entire last corral start the race, I crossed the pad, threw up a peace sign and was out of there. I was the last runner to start the race. Seriously, this was going to be a fun new challenge. Caught up with @ParamedicMike and his wife Karen in the Lilo and Stitch Line! Long story short. I ran at a very comfortable pace throughout this entire race. I stopped for one character picture during the race. I think it took me 20 mintutes to get through the Osborne Family Spectacle of Dancing Lights....I took lots of pictures here since this was going to be the last time that I would see this. I was never worried about my time. I never saw the balloon ladies again. 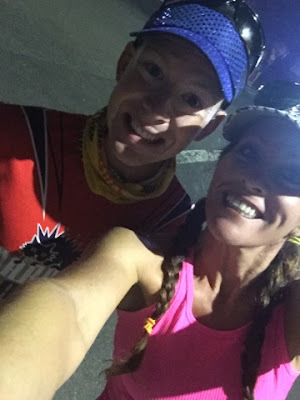 I walked the last 1.25 miles with my friend Jason who was not having the best race. There was no inclement weather at all during the race. My finish time was 1:38 with a 13:53 minute per mile for a 7 miler. 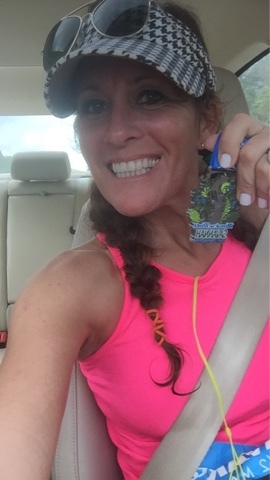 I received a Half Marathon medal for running a 7 mile race. 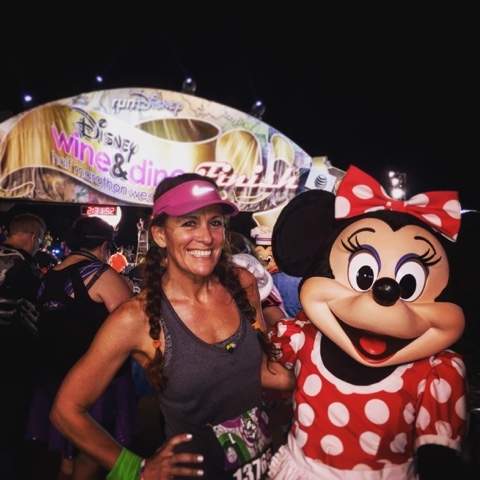 I stopped for a Finish Line picture with both Minnie and Mickey Mouse. I found my Mom at the Finish Line and she was passing out cool packs to the runners. I proceeded on to the after party and stayed there until 4:16am. One of my favorite people to run a runDisney event with...my friend Jason from @Disenvy! Team #FoxyFruitcakes take on the "world" at the after party! Had fun catching up with my BOGP Lizards! My assessment of the rumors and digs on starting in the back corral?? There is absolutely zero reason why any runner would not have a fantastic runDisney race experience by starting at the very back. I chose not to stop at the character pictures but I could have. I had plenty of time to. Every runner has the same opportunities whether they start in the back or in the very front. I had more than 3 hours to enjoy the after party. As long as you maintain a 16 minute per mile (which I did), I will NEVER understand the complaints from last corral runners. I will not get into an argument with anyone EVER about what ifs. We could do that for days. The fact is, if you keep the 16 minute mile pace whether it's by running or whether it's by walking, you CAN cross the finish line within the legal time limits. 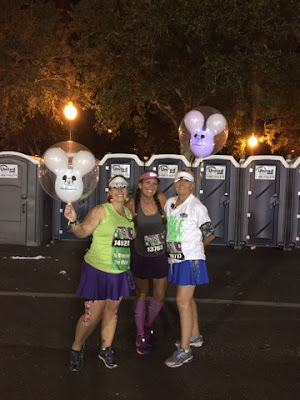 That was my story of 2015 runDisney Wine and Dine Half Marathon. Do I think that both races were right in cutting the course short? ABSOLUTELY. The safety of the runners is priority #1. Do I think that both races could have done things differently? ABSOLUTELY. These were the emails that were sent to us post-race. 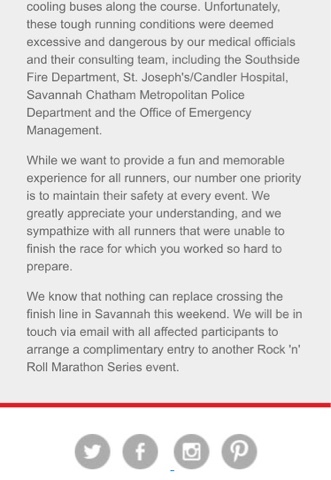 The email from Rock n' Roll was sent out at 10:30am the morning of the race...the race was still in progress at that time. 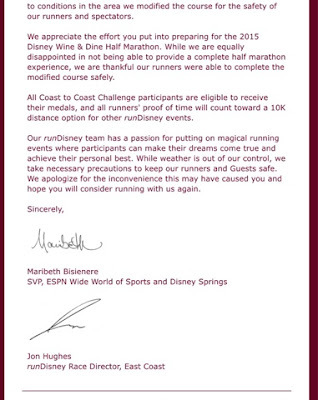 The second email was from runDisney several days post race. I have my own opinions regarding the medals, the race course, the communication, the compensation, the after parties etc.. for both races. 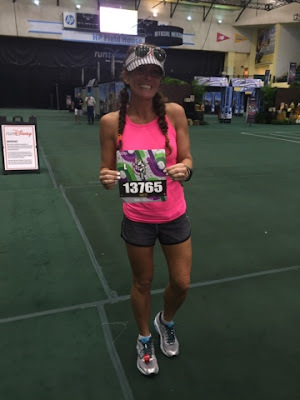 I enjoyed running both of these races on the same day and I really enjoyed dealing with all of the crazy weather, the obstacles, the challenge and the chaos. I have great memories and great stories from both races that I will cherish forever. Not every race is perfect and weather cannot be controlled. How a race deals with these problems and obstacles are important to me. I woke up the next morning, went to Magic Kingdom with my Mom and had the most magical day! However, this was the first time since 2009 that I did not actually WEAR my race medal in the park. I took a photo holding my medal and will not count it as a half marathon. 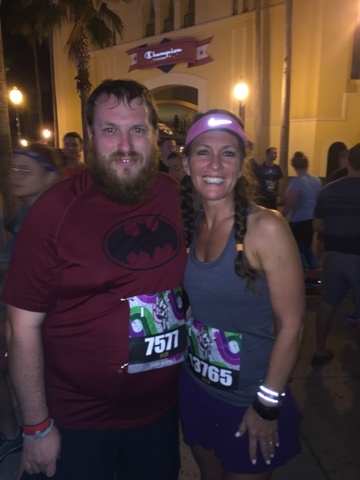 I don't feel that I earned Half Marathon status as #WineDineHalf. 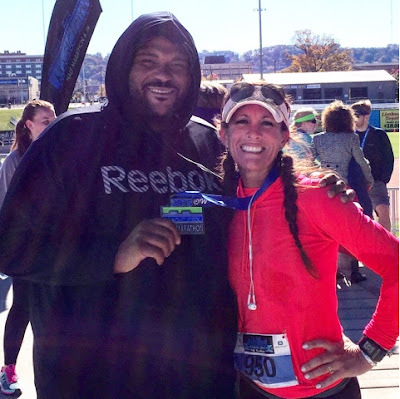 I feel like I ran a 7-miler race and was given a Half Marathon medal. 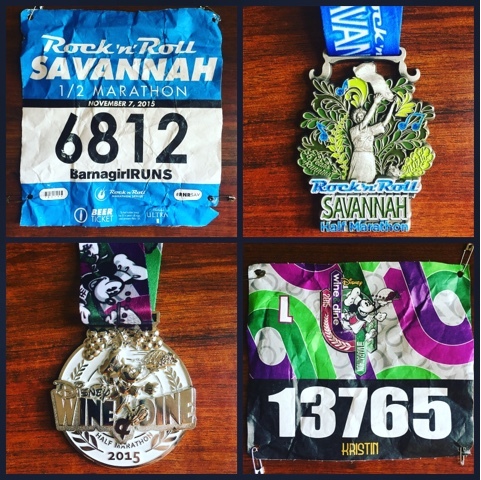 I am very thankful that I was able to complete the entire Rock n' Roll Savannah Half Marathon and receive that medal. 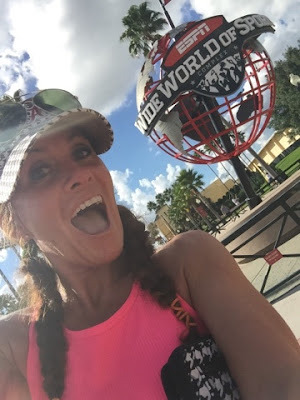 Again, these are my opinions and choose to count the race (Magic City Half) that I have coming up this weekend as my 35th Half Marathon and I had originally planned on counting runDisney Wine and Dine Half Marathon as my 35th. 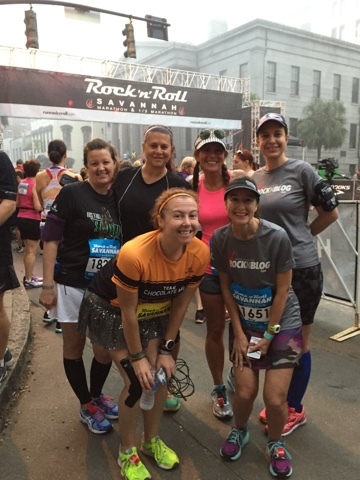 That's my story from Rock n' Roll Savannah and runDisney Wine and Dine Half Marathon weekend. Both were great races, great medals and full of great experiences. There was so much debate and argument going on about both of these experiences....I leave that debate up to you, the readers! Who wore it best?!?! Happy Running, Happy Challenges and Happy Thankful Runner Again! 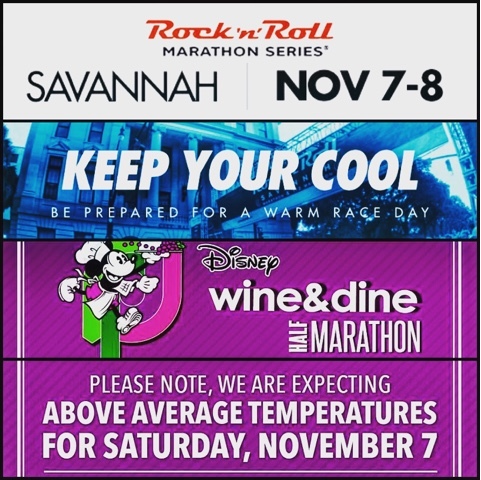 For more information on both of these races and other events, please visit Rock n' Roll Marathon Series and runDisney.com.